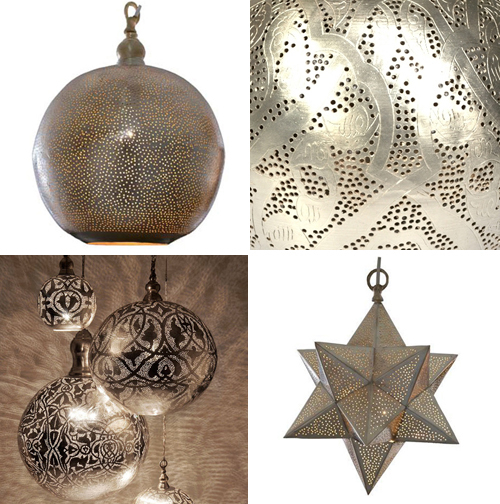 The beautiful copper (with silver coating) pendant lights are back in stock! These pendants are handmade in Egypt. You can see all available models and sizes here. Wow these pendant lights are so unique and beautiful!!! They really make a statement in the room!!! Thanks for sharing! these are beautiful. i wish i had an outdoor space worthy of such a piece but until then i’m sure i could find a place to make it work! The spheres are sooooooooooooo beautiful. I used the stars ages ago and they seem to pop up everywhere these days, but the spheres .. mama mia! I don’t have a project where I could use these, but will definitely keep them in mind. I’m blown away! Dreamy! I want one of each for my new/old house! 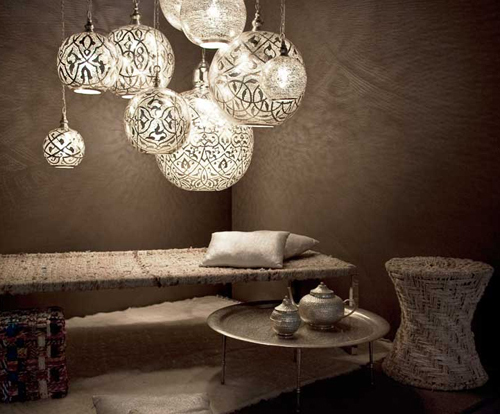 I love the exotic feel of that room. They are abolutly gorgeous. I love these kind of light, the etmosphere it makes and the amazing light and shadow effects. It’s so adorable!!! Wow, those things are cool! Beautiful Egyptian pendants. I love the breakthrough in colour through the beautifully carved sections. I like the foreign and oriental feel it brings. It’s exactly the sort of lighting I pictured for my hallway, although these may be to large and over bearing in my little hallway!